New Hampshire State Police are investigating the vandalism of a granite block outside the state library that commemorates Donald Trump's 2016 New Hampshire primary win. First his Hollywood star, now his New Hampshire granite. 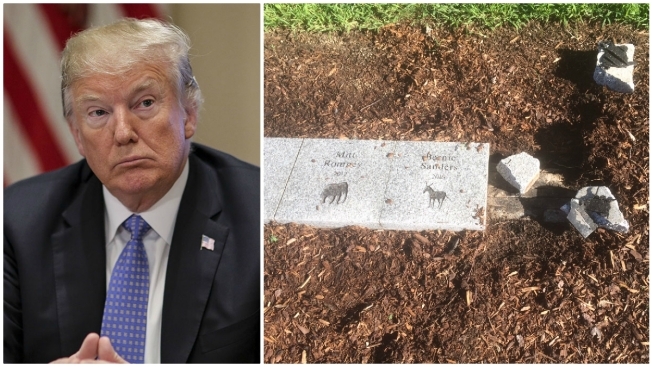 New Hampshire State Police say someone smashed a granite block inscribed with President Donald Trump's name early Friday. The block is part of a display along the sidewalk outside the State Library that showcases winners of the New Hampshire presidential primary. Trump's block was the last one in the line, marking his 2016 win in the GOP primary, right next to Democratic primary winner Bernie Sanders. Police say the block was smashed and scattered on the grass and street. They vandalism was discovered around 7:45 a.m. and is believed to have happened between 4:30 and 6:30 a.m. Pieces of the granite block were found scattered about on the grass and on Park Street. Last month, a man used a pickax to destroy Trump's star on the Hollywood Walk of Fame. The West Hollywood City Council later approved a resolution seeking the star's removal, citing the president's disturbing treatment of women. Anyone with information on the vandalism at the New Hampshire State Library is asked to contact state police at 603-223-4381.